Show you the Three Essential Components of Business Development: Innovation, Quantification, and Orchestration. Reveal the five skills vital to the entrepreneur - Discrimination, Concentration, Organization, Innovation, and Communication. Accelerated Learning Techniques tells you how. Based on Nobel Prize-winning research, the cutting-edge methods revealed here can make a dramatic difference to you and your family, virtually guaranteeing success at work and school. For this is the ideal learning program, enabling you to identify and use your own unique way of learning, unleashing the power of your whole brain. And as a result, you'll gain skills that put you in the top 1% of people in our society. Seventeen memory methods and principles. Seven different intelligences and how to discover which is your personal strength. Five keys to rapid adult learning. Six stages of effective learning. Seven success characteristics and how to make them work for you. just read the book. this is a shiort live version tryjng to sell the ideas and you will buy the book anyway. What made the experience of listening to The E-Myth Seminar the most enjoyable? I read 'E-myth revisited' (EMR) almost 10 years ago now. This seminar was seasoned with examples from the book, as well as new examples. What about Michael E. Gerber’s performance did you like? Very fresh and down to earth. Made some jokes (and laughed at a few of his own) which, to me, made the monologue more genuine. Still deciding if the premise of the book is true in every case (in other words, can any organisation adopt the 'create a turnkey and sell it as a franchise' model). I've been in a service business for 22 years. I wish I had this information 22 years ago!!! Michael Gerber provides the business owner with a method to turn a small business into an empire. Thank you so much!!! This program was so impressive that I listened straight through. Finally something that defines the "how" rather than just the what. I have a clear plan and structure to work with. If you are in business for yourself, you need to read or listen to this book. Completely transformed the layout and approuch I've been taking with my business. I highly recommend it!!! This seminar may be a little dated but there are many great truths that are fundamental and dangerous to deny. I studied Japanese business (lean) and I stick by the real fundamentals of Toyota in my service business. It was very interesting to hear the same ideas, packaged in a way that non-lean people would buy. This is not straight lean of course but stresses how important systems are in every business. And much more is covered. This is a great listen that Americanized my thinking about business. I have already implemented much of the thinking in my business and have seen great results. This is an essential listen. I love the energy! I took a trip with my daughter, driving from New Jersey to Florida. I thought it was a good idea to listen to e-myth while she slept based on my accountant's recommendation. I literally could not stop listening. it was beyond a good or great idea. it inspired me to write down my mission, begin working on my prototype and plan an execution strategy. I'm now ready to do make life changes! The take away is don't get caught up in everyday operations to the point your just any other employee/technician. Rather be a visionary with a mission to grow and create a business sellers will fight to buy. I found the organizational chart exercise especially enlightening. 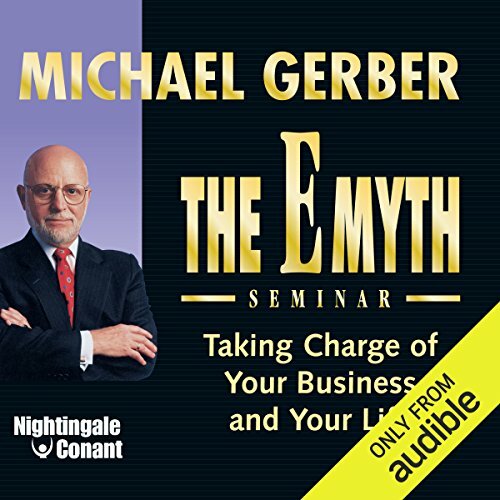 I had read The E Myth and was excited to find this abridged excerpt from a full Michael Gerber seminar. Great content. Excellent delivery before a live audience. The information in this seminar is good. However there is nothing new. Everything he talks about is just a regurgitation of what can be found in the book The E-myth. This Audio program is live from Sydney. Michael Gerber tells a great story! Excellence is key. Protocols are key. Loved every minute of it. I'd advise to have a pen and paper to write down notes. Incredible delivery, energetic and punchy. Content is absolutely spot on, I will be re listening to this again! In order to win in the game of business, you must know the rules and focus on what needs to be done first then how to do it. This is an excellent and very practical and useful material provided through this seminar. Would definitely recommend and review regularly.